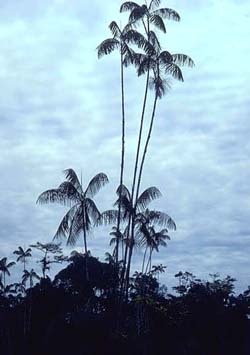 Subcanopy to canopy palm. Stems clustered, to 20 m tall, 10-15 cm in diameter. Leaves to 3 m long; crownshaft sometimes orange or red; petiole with numerous black adpressed scales; pinnae 40-60 on each side, regularly inserted, narrow, slightly pendulous, the central ones 40-70 cm long. Inflorescence erect, 30-50 cm long, with up to 100 branches inserted on all sides of the axis, these 3-4 mm in diameter and covered with short, whitish brown hairs. Fruits black, globose, ca. 1 cm in diameter. Endosperm homogeneous. Seedling leaves deeply bifid. Patchily distributed E of the Andes in Venezuala, Colombia, Ecuador, Peru, and Brazil, in white sand areas below 350 m elevation and on the Andean slopes at 1100-1800 m elevation. 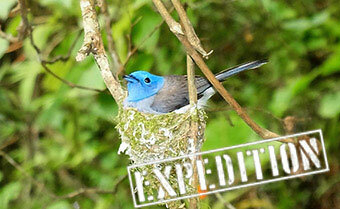 In Ecuador it is known only from the mouth of the Pastaza valley near Puyo, in floodplain forest or in pasture.